A delicious combination of fish fillets and cheesy veggies is baked in foil packets to make this super-tasty dish with super-easy cleanup! 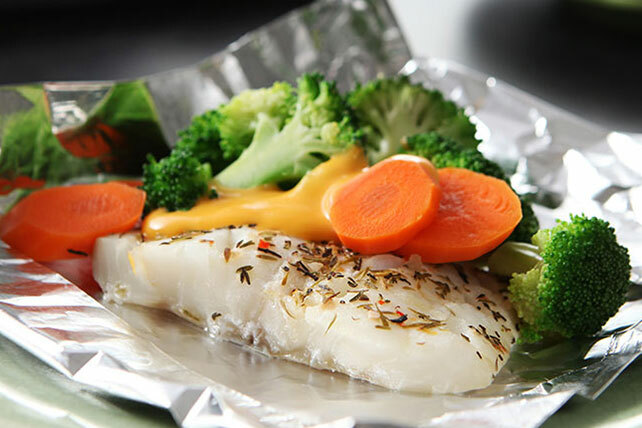 Place 1 fish fillet on center of each of 6 large sheets of heavy-duty foil sprayed with cooking spray; drizzle with dressing. Sprinkle with thyme; top with vegetables. Fold to make 6 packets. Place on rimmed baking sheet. Bake 25 min. or until fish flakes easily with fork. Let stand 5 min. Cut slits in foil to release steam before opening packets. When purchasing fresh fish fillets and steaks, make sure that they have a firm texture, moist appearance and fresh odor. (They should not smell fishy.) Store in the coldest part of the refrigerator for no more than 2 days. Prepare using any other firm white fish fillet such as halibut.